This Dark Chocolate Pecan Tart is fancy enough to impress but quick and easy enough to make any time for that very special someone. Some desserts just scream I’m fancy and must be too sophisticated and just too difficult for most people to make. 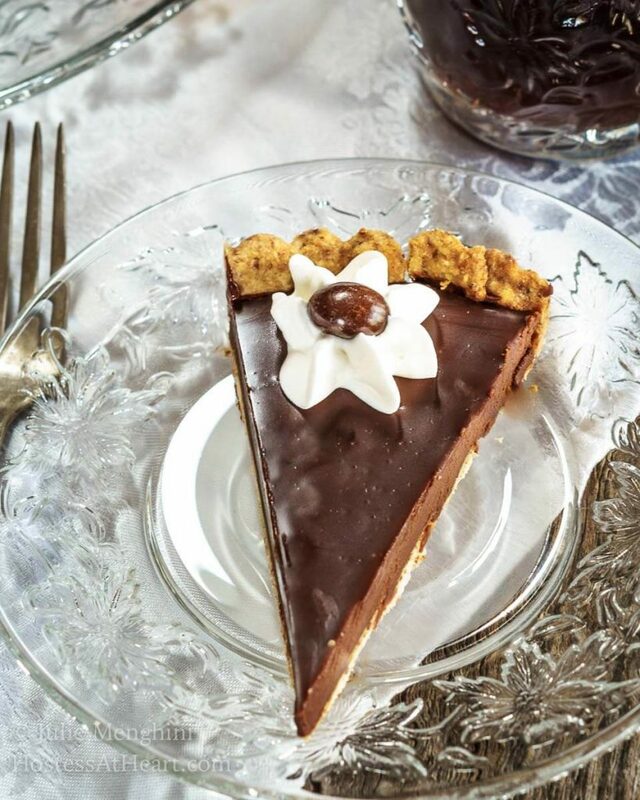 Just like this Dark Chocolate Pecan Tart. I made this Dark Chocolate Pecan Tart for the holidays, and my 92-year-old father-in-law asked for the recipe! 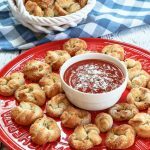 Now I’m not sure what he’s going to do with this recipe because he doesn’t cook and I’m pretty sure he’s never baked a thing in his life, but I was so flattered that I’ll be making one of these beauties just for him and whomever he decides to share it with. Hopefully my 90-year-old mother-in-law! The thing is that this baby is just a classy girl. You take one look at her and think she belongs in a fancy bakery. 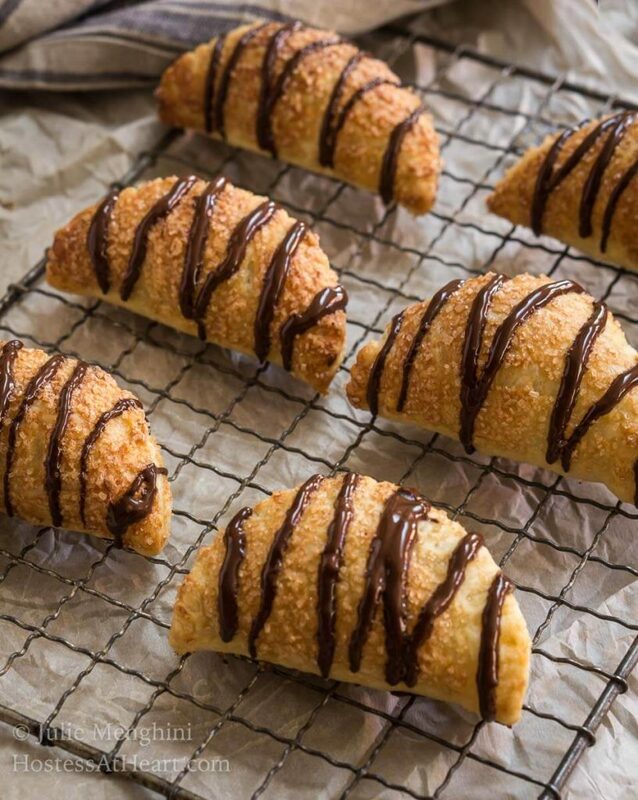 The truth is that it’s not difficult to make but is full of a deep dark chocolate filling that’s surrounded by a delicate pecan shell. Another great thing is you can easily make this tart a day or two before you need it. I made the shell on one day and filled it the next day. Of course, we dove in a few hours later, but the leftovers were just as luscious the next day. 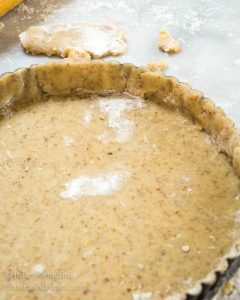 If you are nervous about making a tart, these pictures show you the process and how “rustic” it looked while I was putting it together. The baked shell kept all of my messy secrets and will yours too. 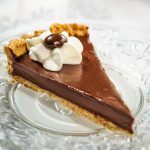 This Dark Chocolate Tart is fancy enough to impress but quick and easy enough to make any time for that very special someone. Coarsely ground pecans in a food processor. You don't want large pieces but you don't want butter either. Add 3/4 cup flour, salt, and sugar and pulse until combined. Add cold butter and pulse until crumbly. Add water 1 tablespoon at a time pulsing until mixture forms a ball. 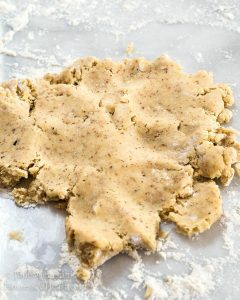 Remove the dough and form into a disc. Cover with plastic wrap and refrigerate at least 1 hour. Lightly dust your work surface with flour. 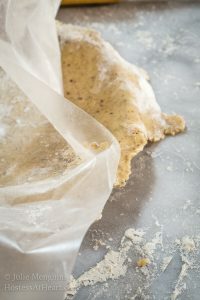 Remove the plastic wrap from the dough and break into 4 pieces. Smush two pieces together with the heel of your hand until just workable. Repeat with the third and fourth pieces. 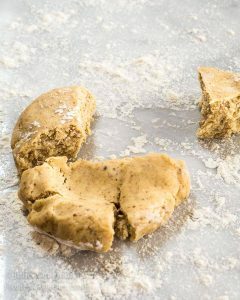 This will make the dough easier to work with and prevent cracking. 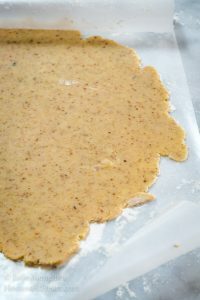 Dust a piece of waxed paper or parchment paper lightly with flour. 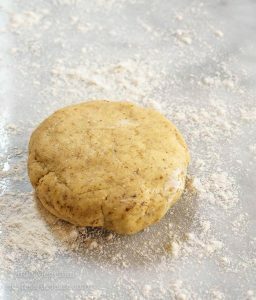 Roll dough out into a 1/4" thick circle. Pick up the paper and flip it over into a 9-inch tart shell with a removable bottom. 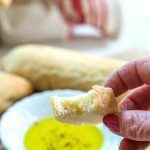 Press the dough into the pan and patch any uncovered areas with extra dough. 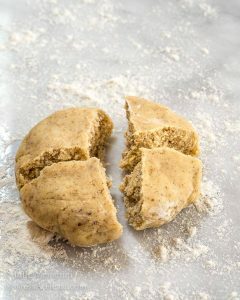 Trim the top with a rolling pin so tart dough reaches the top but doesn't overhang the pan. Refrigerate the shell for 10 minutes. 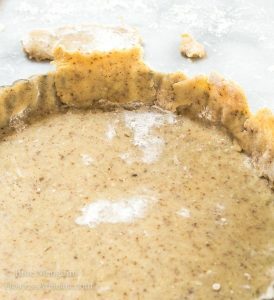 This will help firm up the dough so it doesn't slide down the edges while baking. Remove from the refrigerator and pierce the shell several times with a fork. 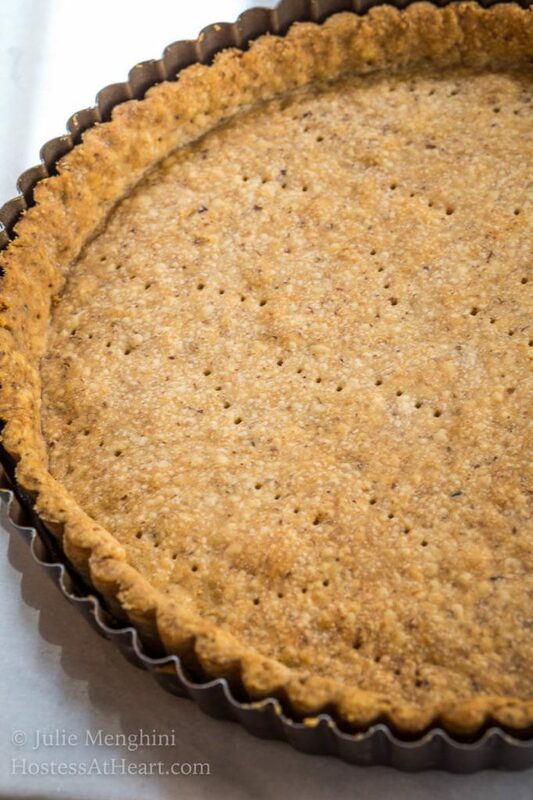 Place the tart pan on a baking sheet and bake 25 to 30 minutes or until golden brown. Allow to cool completely in the pan on a cooling rack. Place the chopped chocolate into a medium-sized bowl. Microwave the cream until it just starts to boil. Pour hot cream over the chopped chocolate and stir with a heat-proof spatula into smooth. Stir in butter, stirring until incorporated. Pour into the cooled tart shell. Refrigerate until chilled, approximately 1 hour. 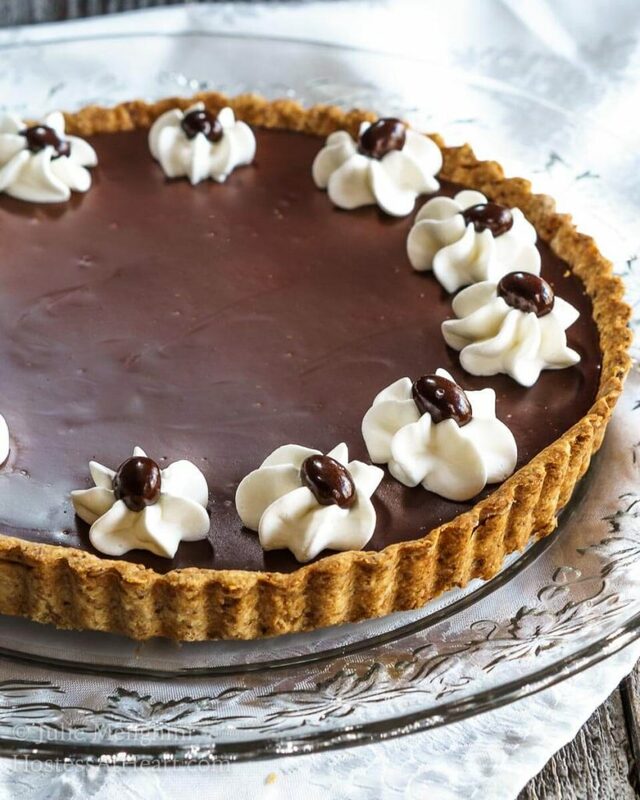 Now, that very special person that you should make this tart for is YOU! Here are a few of my most popular desserts! Julie, this tart is absolutely gorgeous! Just so you know, these wonderful dessert combined two of my very favorites: pecans and chocolate. I’ll be dreaming about this all week. 🙂 Pinned, of course! Thank you so much, Demeter! It’s so sweet of you to stop by and leave such kind comments! Oh my JULIE!!! Be still my fluttering heart! Look at this gorgeous beauty you’ve created, from the pecan pastry, the smooth chocolate, to the spectacular presentation with that piping. My word child, you know how to melt a person’s heart eh? Tell you what? You know how we always say we will be meeting one day, somewhere……well this is what I’m requesting from you please. Pretty please? LOL! Thank you! You’ve got it, Loretta! This will be chilling while I wait on the doorstep for your smiling face! Will you make this for me for Valentine’s, Julie? There’s no doubt that this one tastes heavenly. Thanks for sharing! Happy FF! Thank you, Jhuls! Hope you are enjoying FF too! Hi Julie! You really are the queen of pies! 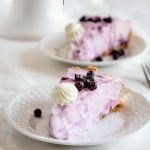 Angel food pie, cheesy quiche, and now this gorgeous pie! It looks so decadent and silky smooth Can’t blame your father-in-law for asking for the recipe when he doesn’t bake! Thanks for sharing, Julie! Happy Fiesta Friday!! Thank you Ai! John and I have been eating too much pie lately and are now concentrating on salads LOL! Thank you so much for hosting FF this week. Running over to update my post. 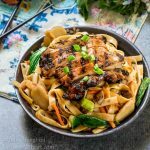 Wow, this really does look like it belongs in a fancy restaurant – actually, it looks far better than some of the ones I’ve seen in restaurants! 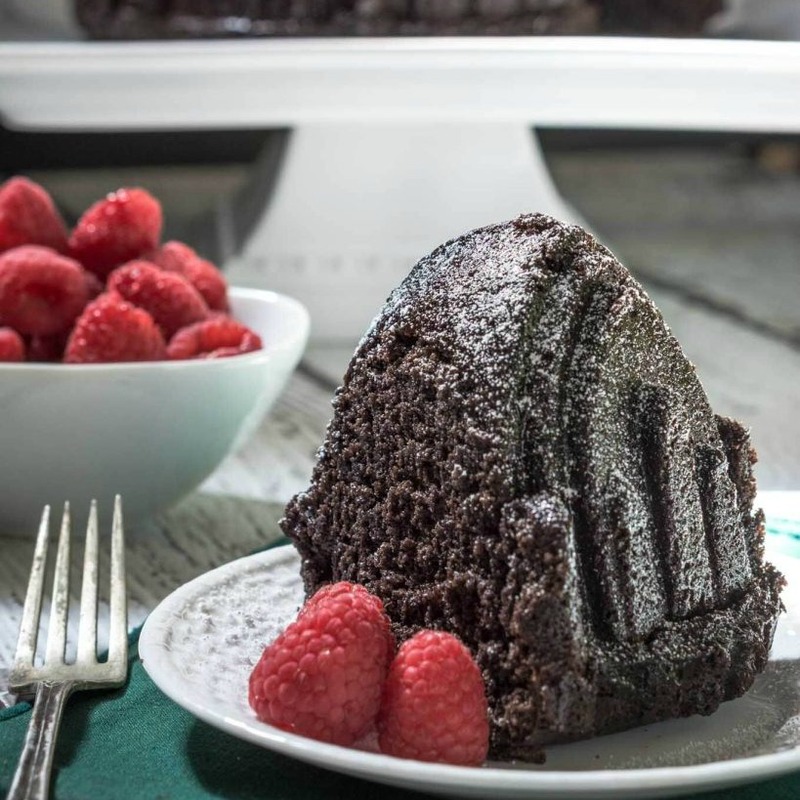 The glossy chocolate, the pecan crust…I’m drooling over here! Thank you, Mara! This is definitely great for a chocolate fix! Hope you have a wonderful weekend. 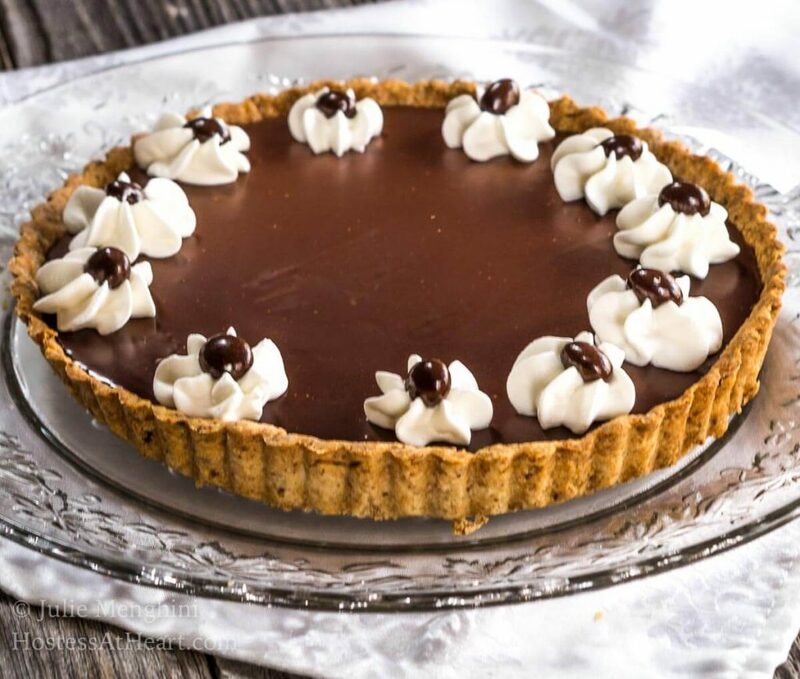 This tart looks absolutely divine! I would definitely happily have a slice! You come on by and I’ll make another! Thank you, Caroline! It’s no fair that you don’t deliver! This looks delectable! Thank you, Annie! If you’re in the neighborhood shout and we’ll have a slice! Julie, this pie looks amazing! I am saving this for a special occasion. Delicious and beautiful! Thank you Antonia! It is definitely perfect for a special occasion. Have a wonderful weekend my friend! 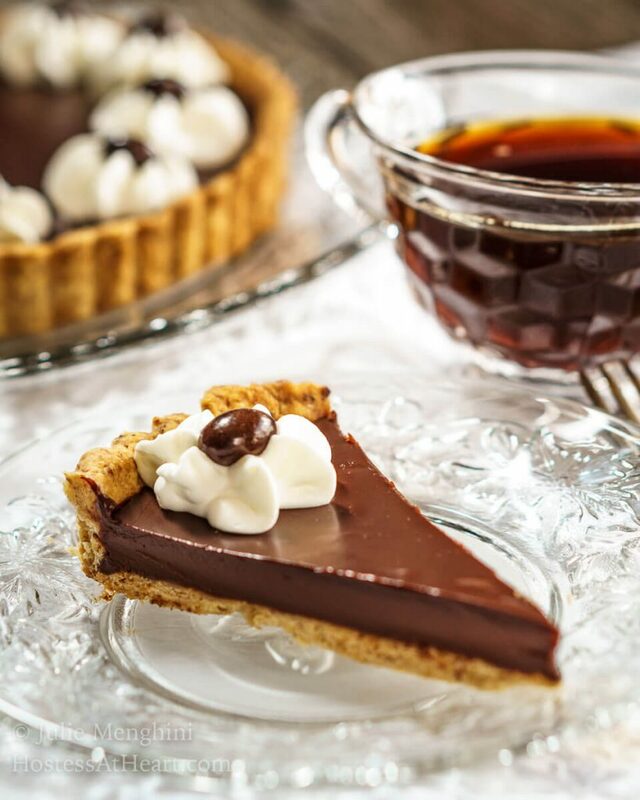 I love most any recipe that includes pecans but your chocolate tart is definitely special. Beautiful. Thank you, Karen! It really is one of my favorites too. Have a wonderful weekend! Oh, you’ve gone and done it now! LOL This is an elegant-looking dish! Thank you Patti! We loved this one. I’ve got to make another one! I might not be the biggest “chocoholic” around but I sure would enjoy a piece of your tart Julie. Thank you, Judi! I really enjoyed a small piece! I’m glad I had company to finish it off! Thank you, Sarah! That was priceless! 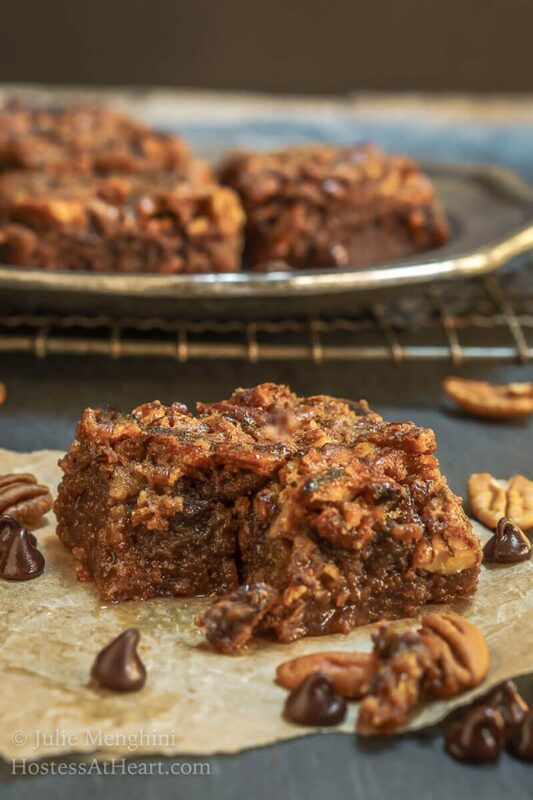 This does look so enticing, and chocolate and pecans are a great combo. You’re missing an ingredient, btw. That’s hysterical about your FIL wanting the recipe!! I’ve been asked for lots over the years and it’s sometimes been hard to not be rude. “Why do you want a recipe when I know for a fact that you don’t cook?” Anyway, saving this pie for the holidays. Thank you for pointing out my missing ingredient I really appreciate it. I loved this combination too. I hope you’ll let me know what you think if you get it made.